The next event attracting broadband, tech, and policy experts is coming up in October in Ontario, California. 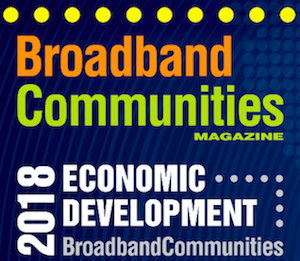 The 2018 Broadband Communities Economic Development Conference, titled “Fiber For The New Economy,” is set for October 23rd - 25th at the DoubleTree by Hilton Hotel Ontario Airport. Register now and, if you qualify, receive a special Government Rate for your hotel. A special block of rooms are reserved for conference attendees until October 1st. View the agenda to see all the details about the program. Speakers and panel participants will examine what’s happening in urban and rural areas, including municipal projects, work by cooperatives, and partnerships. Scott Ochoa, Ontario’s City Manager, will deliver the Welcome Keynote address to be followed by a panel discussion about the city’s fiber network and how community leaders are using it to advance economic development. BBC Mag’s Masha Zager will lead the panel. Authors James and Deborah Fallows will provide a Keynote address and Christopher will participate in the Blue Ribbon Session along with Dr. Nicol Turner-Lee from the Brookings Institution and Will Rhinehart from the American Action Forum. Along with panel leader Lev Gonick, CIO from Arizona State University, they’ll discuss some of the top issues that link high-quality connectivity to economic development, jobs, and digital inclusion. We expect to see a lively debate at this panel discussion. Later in the conference, Christopher will also be participating in other conversations, including heading up a panel on the increasing activity of cooperatives and how they're bringing broadband to rural areas. Check out the rest of the agenda to decide which panels and presentations you can't miss. In addition to the main panels and presentations, the Coalition for Local Internet Choice (CLIC) will present a special program later in the day of Tuesday, October 23rd. “Making Local Internet Choice Happen in a Changing Environment: Opportunities and Challenges in 2019” addresses the rising interest in local community efforts develop publicly owned fiber optic networks for better connectivity and state legal barriers that hamper those initiatives. The CLIC program will cover the situation at the federal, state, and local levels with policy experts keeping their eyes on positive and negative changes. In addition to our own Christopher Mitchell, expect to hear from Jim Baller, President of CLIC and one of the best-known attorneys in this space, Deb Socia from Next Century Cities, who is tapped into what’s happening all over, and others. The coming year will be critical for local internet choice. CLIC and its allies must redouble efforts to make local internet choice a national priority at all levels of government, to oppose new state barriers and to roll back as many of the existing barriers as possible. Join us in Ontario, CA, on October 23 for our next half-day CLIC program, where we will bring together some of the key thought leaders in our field, review what we’ve learned in 2017-18 and develop a game plan for all of us in the CLIC community — government officials, private sector leaders, community advocates and many others — to be as effective as possible in 2019.